Among several firms literally hammering away at this prospect is Rocketplane Limited, Inc., an Oklahoma corporation. The company is eager to make space travel as safe, convenient, and routine as air transportation, with work ramping up on their Rocketplane XP design. The spaceliner's first commercial passenger flight is projected to be early 2007. The plan calls for Rocketplane XP to depart from the Oklahoma Spaceport located in Burns Flat and whisk customers skyward to over 60 miles (100 kilometers) above Earth. At that height, a spectacular view is promised, along with "over the top" weightlessness for up to four minutes. The company also envisions transporting innovative scientific experiments and valuable payloads to sub-orbital space and beyond. Rocketplane XP and the space tourism business were highlighted here at the Space Technology & Applications International Forum (STAIF), held February 13-17. "It's going to be a cool ride...the world's largest roller coaster. And you get your astronaut wings too," said Charles Lauer, co-founder of the company and director of business development. Lauer said the Rocketplane team has spent some $4 million over the last 10 months on the project. Total investment is $30 million to get the first XP built, through flight test, and nudging its way into revenue-generating service, he said. 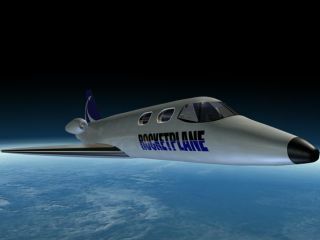 Rocketplane Limited, Inc. has obtained from the State of Oklahoma a $13 million face value Investment Tax Credit to develop a re-usable sub-orbital tourist business at the Oklahoma Spaceport. Rocketplane's main office and engineering center are based at Will Rogers Airport in Oklahoma City, and quite appropriately located on Amelia Earhart Lane. In addition to the XP spaceplane, the company is delving into future space vehicle activity that is expected to have a high return on investment, Lauer explained. "There's real engineering going on," Lauer told the STAIF gathering. "After 10 years of working on this project, now we've got real hardware." The fuselage of the Rocketplane XP is a modified Lear 25 series using the same General Electric CJ-610 turbojet engines found on the standard business jet configuration. Those powerful engines are used for takeoff and then shut down after rocket engine ignition. The XP jet engines would be restarted at high altitude after reentry, as the craft makes it way on the approach corridor to the Oklahoma Spaceport. Those jet engines, by the way, are the non-afterburning version of the J-85 engines that Scaled Composites uses on the White Knight carrier craft that totes SpaceShipOne to release altitude. Lauer said Rocketplane engineers are building a new delta wing that attaches to the Lear jet fuselage - on the same keel plate used to mount the current wing structure. In addition, a new aft fuselage structure is being fabricated to accommodate the rocket engine thrust loads, as is a new vertical tail structure. Orbital Technologies Corporation of Madison, Wisconsin is providing the main rocket motor that incorporates patented vortex engine technology. Lauer told SPACE.com that the suborbital craft will undergo an extensive series of shakeout test flights next year. "We're going to have a lot of data before we start commercial service." Runway rollout of the fully operational XP is slated for the middle of 2006. The welcome carpet for paying customers is to be rolled out the following year. The going rate for the up and going passenger is now targeted in the $150,000 to $160,000 range, Lauer explained. The "gas and go" traffic model for the XP starts at about 200 people a year, Lauer said. "Our capacity is a lot more than that." Given two XP vehicles, flights would be dedicated primarily to tourism, as well as microgravity research, Lauer added. Last year, Rocketplane and Incredible Adventures of Sarasota, Florida announced a marketing agreement in which both companies will begin taking reservations for the XP space flights. Taking adventure to a higher level is what space tourism is all about, said Jane Reifert, President of Incredible Adventures. "I'm starting my own little campaign to change the phrase space tourism," Reifert told the STAIF audience. "To me a tourist is somebody going to Disney World with a camera and blocking traffic when I'm on the way to work...somebody getting in the way." Reifert said that those hungry to fly into space are highly educated and highly motivated individuals. They are risk takers, space thrill-seekers, and adventurers, she said, and shouldn't be associated with someone just camera-clicking away. There are a number of lessons learned that Reifert and her company have already chocked up in the adventure tourism business. "Marketing space will not be easy. Fun haters are everywhere. Most of them are lawyers, insurance agents and government officials. Anyone marketing space to civilians must be prepared to meet obstacles," Reifert reported. A suborbital flight is no vacation, Reifert noted. "Adventurers are fulfilling a lifelong dream. They will pay premium price to see their dream come true...but they expect a premium product in return. Be prepared to deliver everything you promise and more," she advised.